There is no subway station in our neighbourhood, but there is a new LRT station under construction! TransEd gave us permission to play some Bach on the actual construction site. 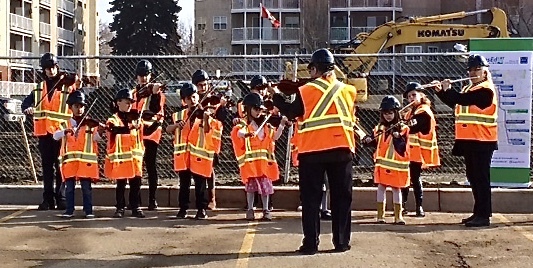 After a minuet or two, we moved into the Bonnie Doon shopping mall for a flashmob and more music at the LRT presentation centre. Scroll forward to 10:36 in the clip to find the segment on our 2019 Bach in the Subways event.